The top Republican in the Iowa House is making it clear she opposes any attempt to expand Iowa’s medical marijuana law. Earlier this week a senate committee approved a bill to remove the limit on the potency of the cannabis oil, pills or creams that will be sold in Iowa later this year. The bill would also let many more Iowans get medical cannabis if a doctor says it could help their condition. 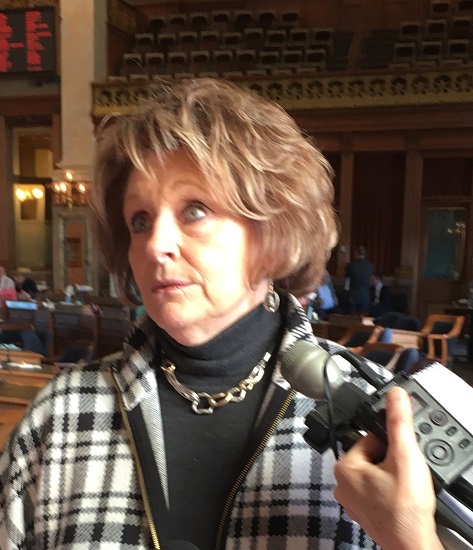 House Speaker Linda Upmeyer, a Republican from Clear Lake, says she wants to stick with last year’s agreement which set up a system for growing, producing and selling medical marijuana in Iowa. “Actually the thing that got our members to an agreement last year was the fact that we would set up an advisory board and then, instead of legislators who have no real knowledge of health care and treatment plans and that sort of thing, we’d be taking the recommendations of a board of physicians and people who understand this topic,” Upmeyer says. That board is scheduled to hold its first meeting in May. December 1 is the first day anyone in Iowa may legally buy cannabis products from the five state-licensed dispensaries. Upmeyer notes the 2019 legislature starts soon after, in early January. “I think we’ll be back in time to make changes if that’s the recommendation of the board and so I think we should stay with the plan,” Upmeyer says. Companies that have gotten the state licenses for growing, making and selling cannabis products in Iowa say the current law’s restrictions mean there won’t be enough customers to make the program economically viable.